To facilitate the identification and development of talented junior athletes from the North Coast of NSW. In order to achieve this mission, the Academy supports talent development programs in partnership with state and regional sporting organisations, and conducts development activities for athletes and coaches. Since 1989 the Academy has assisted many athletes to achieve success at state, national and international level. The geographic region covered by the Academy is vast, extending over 500kms from Tweed Heads in the north to Laurieton in the south. The region includes the local government authorities including Kyogle, Tweed, Byron, Lismore, Ballina, Richmond Valley, Clarence Valley, Coffs Harbour, Bellingen, Nambucca, Kempsey and Port Macquarie-Hastings. Tweed-Byron – covering the councils of Tweed and Byron. Northern Rivers – covering the councils of Lismore, Ballina, Kyogle and Richmond Valley. Coffs Coast – covering the councils of Coffs Harbour, Bellingen and Nambucca. 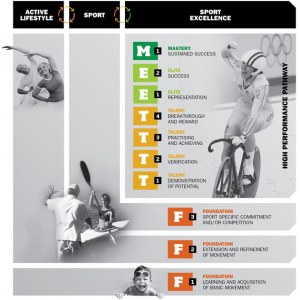 The model, adopted by Australian Sports in defining High performance pathways. The Regional Academy of Sport Collective are commissioned by many to operate in the T (Talent) section of the pathway moving athletes from T1 to T4. The Academy was established in 1989 in response to the desire to give talented North Coast athletes an opportunity to develop their sporting potential without having to leave the region. Over that period the Academy has assisted thousands of athletes in achieving success at regional, state, national and international level. The Academy is a community-based, non-profit organisation with its office based within the School of Health and Human Sciences at Southern Cross University in Lismore. The Academy acknowledges the support of and works closely with NSW Government – Office of Sport and Southern Cross University. The North Coast Academy of Sport is part of a network of eleven regional sport academies in NSW, each of whom work towards the NSW state development plan for junior talent development. The Academy’s mission; is to facilitate the identification and development of talented junior athletes from the North Coast of NSW. Conduct quality Sport Talent Enhancement Programs (STEP) in targeted sports. Provide Coach development resources and opportunities. Provide an ancillary Education program to athletes and coaches. A voluntary board consisting of up to 12 members manages the Academy. The Board is in charge of all strategic direction and policies of the Academy. The Board, chosen from the North Coast public and elected by members of the Academy, meets at least four times per year. The Chairman leads the Board and the Executive Committee. The Executive is made up of around five members from the Board. They meet regularly to deal with more day to day operational issues. The Academy has five sub-regional committees, each of which is made up of volunteers from within the respective region’s community. The chair of each sub-regional committee automatically receives a position on the Board of Management. The focus for sub-regional committees is on developing community awareness and support mechanisms for athletes, coaches and families, and to undertake fundraising activities. The Sport Committee oversees the initiatives of the STEPs, Talent Development Days, Scolarship Scheme and Coach Development. It recommends to the Board policies and procedures that ensure the quality of these strategies are upheld. The management and policy decisions of the Board and its committees aims to provide a stable platform that allows coaches, managers, and state and regional sporting organisations to develop and run a high quality program. The Academy, as a community based organisation considers the community as an integral part of its corporate structure in providing support and recognition to the athletes. The Executive Director undertakes the day to day management of the Academy. This role assists in linking together the activities of all area under the direction and policies of the Academy. The Executive Director plays a critical role in the planning and evaluation of the STEP and liaises regularly with the coach and manager of each sport.